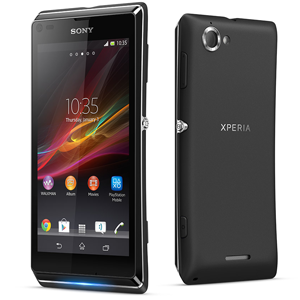 Released in the spring of 2013, the Sony Xperia L is a mid-range smartphone running Android 4.1.2 Jelly Bean. The Xperia L has a Snapdragon dual-core CPU clocked at 1.0 GHz, as well as 1 GB of RAM. Using a 4.3" LCD screen, the phone has a resolution of 480x854. It has a concave battery cover made with plastic and a thin rubber cover. The Sony Xperia L uses a backside-illuminated camera sensor in an effort to improve picture taking quality during low light environments.